Bridging the sonnet and palindrome through a rich taxonomy of new literary forms, Table of Forms is a collection of experimental, ludic, constraint-driven poetry; a puzzle book; and a writing manual. Dominique Fitzpatrick-O'Dinn and her skilled team of collaborators have created the most comprehensive survey of noncanonical poetic techniques since the Oulipo Compendium. Offering myriad reading paths, this multisequential anthology includes a Table of Contents, Table of Forms, Glossary of Forms, and a matrix on the back cover. As every form implies myriad undiscovered forms. 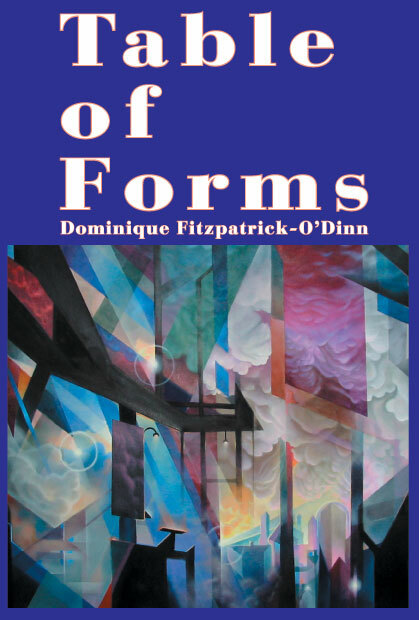 More than a catalog of writing techniques, Table of Forms is a system of creating new poetic structures that points the way to an endless variety of new literary experiments. Table of Forms is a laboratory that makes readers writers. Hardback: 6 by 9 inches. 124 pages. ISBN 0-9724244-6-6. $25. Contains indices not in the paperback: a detailed description of each poem and a more elaborate matrix on the back cover. Definitive Fourth Edition. Paperback: 6 by 9 inches. 114 pages. ISBN 0-9724244-7-4. $12. Definitive Fourth Edition.